In recent years, Hawai’i Island (aka the “Big Island”) has become known as a center of increased environmental awareness and an emphasis on more sustainable living. This forward-looking lifestyle ethic has now come to fruition in a new community being developed on the Island’s Hamakua Coast. Kuwili Lani, which means “to embrace the heavens”, is the first- of-its-kind agrihood (agricultural neighborhood) on the island which, as the term implies, is an intentional residential community promoting independent food production, the use of renewable energy, green building and a low-impact, sustainable lifestyle. It’s an approach that developers around the state are slowly starting to embrace – hoping to attract both younger and older homebuyers who are increasingly mindful of how their living choices affect their communities and the planet. In addition to the private sector, it’s a trend that’s receiving more attention and advocacy at the government level as well. One such proponent is State Senator Lorraine Inouye who recently visited Kuwili Lani to gain some insight and get a look at the innovative project. A former Hawai’i Island mayor, for the past four years Inouye has represented State Senate district 4, which is the largest in the State and includes the Hamakua Coast, as well as most of the north half of the island. In the State Senate Inouye serves on the key Water and Land and Ways and Means committees as well as chairing the Transportation and Energy committee. These committees, which encompass water, land, agriculture, environment, energy and transport, are all key to formulating government policy that can potentially raise awareness of the need for more upcoming alternative energy initiatives and new “green” developments. 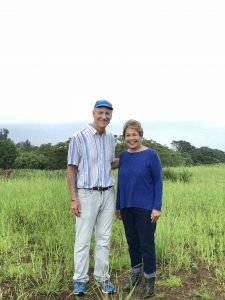 During her visit to Kuwili Lani, Inouye met with Michael Whelan who along with two partners and almost a decade of effort made the project a reality. Whelan likes to point out that the project grew out of understanding how the built environment affects all of us on the planet; and from that, a vision of how to create a more environmentally friendly and sustainable lifestyle surfaced. 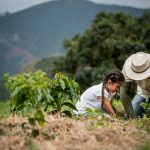 This sustainable lifestyle also incorporates the idea of producing one’s own food as much as possible; hence the idea of an agrihood: a neighborhood that also incorporates agriculture and food production and establishes a tie with the land, rather than merely passively living on it. Whelan has already planted hundreds of banana trees and citrus in multiple orchards on the Kuwili Lani site. In addition to the orchards, there will be vegetable gardens, greenhouses and aquaponic systems. With more than 50 different species of edible landscape on the Kuwili Lani property, homeowners will have a veritable Garden of Eden. The agriculture aspect of Kuwili Lani setting the bar as a model for Hawaii developers is especially appealing to Inouye: she has worked to support a variety of Ag initiatives in her district and is also a farmer with her husband Vernon, having been long-time operators of an anthurium flower farm on the east side of the island in Hilo and Puna. Inouye said she foresees Kuwili Lani and other similar projects as also being integrated into school farm programs that help educate young people on the connection of local food production to a larger sustainability awareness. “I know I’m not the only senator who is supporting these [renewable] energy initiatives and projects like Kuwili Lani,” says Inouye. Inouye says this considering the State’s mandated goal for 100 percent of the State’s energy needs to come from renewable energy sources by the year 2045. Last year renewables provided slightly more than 27% of the State’s energy needs, well behind the nearly 50% levels of states like Oregon and Washington and those of other Mainland U.S. states, as well as some foreign countries. Therefore, communities like Kuwili Lani are a step in the right direction for Hawaii. While the State’s path to all-green power still has years to go, Hawaiʻi Island, meanwhile, continues in the forefront of renewable energy sources – primarily solar, geothermal, and wind – and is likely on track to meet a target of more than 92% renewables just 12 years from now. For more information about Kuwili Lani call Julie Keller at 808.987.7931 or email Julie@HawaiiLife.com .